The four businessmen had set off from Canvastown the previous day, travelling the main Maungatapu road. Pack horse in tow, they were transporting their gold to the West Coast. It had been a tough climb but the steepest pinch, up to the Maungatapu saddle, still loomed ahead. After that it was all downhill to Nelson. They never made the saddle. There was a shout and the ambush was sprung. The first businessman was strangled, the three remaining shot. One of the bodies was hidden in attempt to obfuscate the crime. The bandits’ celebration was however short lived. They were discovered, convicted and hung. Roughly a hundred and fifty years later, our small group of mountain bikers chose to follow the footsteps of the unfortunates. 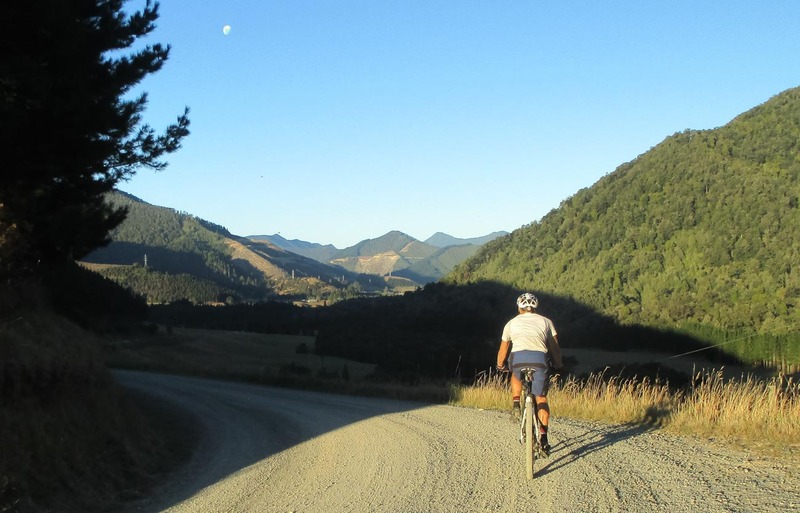 We hoped for a more successful expedition than theirs and indeed it began well as we pedaled off from Pelorus Bridge under clear skies. We traversed the smooth gravel road in good spirits beside the chattering Pelorus. I was wondering if the businessmen had been as buoyant at the outset of their fateful journey. But then my musing was interrupted by the road’s sudden turn skywards. 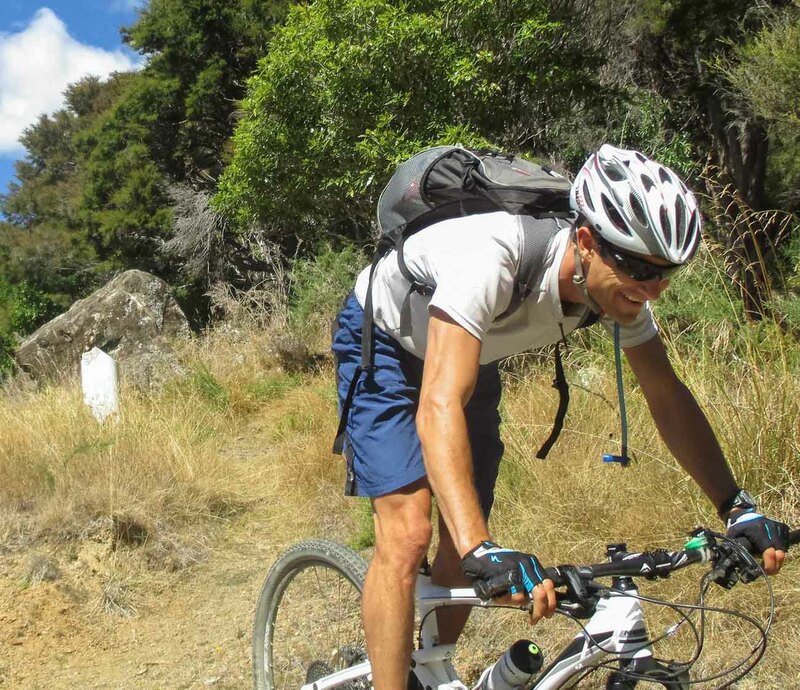 Thus began a typical Marlborough mountain bike ascent, a seemingly endless winding rocky slog. 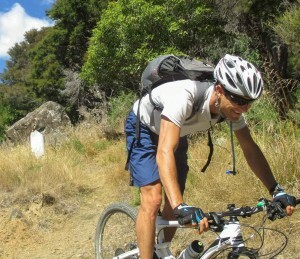 But we were armed with state-of-the-art mountain bikes, with 30 gears and suspension. Compared to 19th century packhorse trekking, there seemed little cause for complaint. Around a bend and there we were – Murderers Rock, the ambush site from so long ago. Like the historic victims, it was time for a rest stop, although ours was just temporary. We toiled on, the climb becoming ever steeper. Baby-head boulders threatened to dislodge us as we finally reached the 750m Maungatapu saddle. The brutal climb had strung out our small band. The foremost amongst us waited for what seemed an eternity. Maybe the ghosts of past atrocities had reached out their cold vengeful clutches seeking retribution? But no. Once again we were united, devouring soggy sandwiches with the multicoloured tapestry of Tasman stretching below. However the Maungatapu road had again claimed victims. With rumour of the return ascent being even more unforgiving, most of us had had enough. The intention to descend triumphantly into Nelson had been abandoned, except by two of us. For myself, there also remained the unfulfilled promise of fresh fish at the Sprig & Fern. A bowel-churning descent finally came to an end at the Maitai Dam, but not before the infamous road obliterated both my rear inner tube and my brake pads. The first stage was over though. The boulders morphed into gravel and then into seal as we sped westward towards civilisation. We loitered and feasted, and by the time we departed Nelson the sun was sinking to the horizon. We pushed onwards, well aware of the late hour. Being caught in darkness at Murderers Rock was not a prospect to relish, so, ignoring the greasy food that sloshed in our bellies, we began a very punishing ascent. I made it my personal mission to defeat this climb, to deny it the pleasure of forcing my foot down, and after a half hour of sweat and grind I shouted my exultation at the empty Maungatapu sky. The final run back down to the Pelorus was fast and exhilarating, but at the darkening site of the murders, I involuntarily stopped dead in my tracks. Again my bike felt the cruelty of the Maungatapu, and I hastily replaced a butchered inner tube. I was glad to be gone from the site of slaughter, but the road had not finished eking out its punishment. With the sun glinting at the horizon we reached the valley floor, only to discover my wheel had been bludgeoned to the point of near death. A number of spokes had been dismembered as I nursed a battered machine back to the Pelorus carpark. It had been a wonderful ride, an epic outing with a historical twist. We were relieved to have made it, and only just before nightfall. While the road had exacted its toll and the bike had been savaged, the bodies were fine. But if we had been just a little later and forced to traverse the Murderers route in darkness – who knows? Maybe we would have finished up like those poor unfortunates from so long ago. Or maybe I should get a rein on my imagination!